Our predictions are below, make yours in the comments section. The winner will receive the admiration of the Cooler staff. More than likely we will be live-blogging the results and speeches starting sometime this evening. There's an even greater likelihood that if it happens it will be the Cooler's swansong, so don't miss it. John McCain advisors are touting a MAJOR endorsement coming out of New Hampshire very soon. Imagine a McCain 3rd place finish and a Huckabee victory, followed by Fred Thompson and another big NH figure endorsing McCain between now and Tuesday. Talk about momentum! And for bonus points, check out the Cooler's favorite son, Jon Seaton expertly lowering expectations. Atta boy JS. McCain is shaping up shockingly well at this stage in the game. So says Doug Gross. Anymore than that will mean a big L for the Mittens. Jeff Fuller is liveblogging with Mitten all day. Check it out. Things are not looking up in Hillaryland right now. Chuck Norris likes to talk about how many people Awshucksabee has killed. For the best blogospheric coverage in Iowa outside of the Cooler, read O.K. Will be back with more rumors and innuendo from the streets of Des Moines soon enough. Patrick Ruffini is starting a cool program, where he's asking Iowans to report on the happenings at their caucus so we in the blogosphere can get up-to-date information. Go here for details. Keep the cooler posted as well at caucuscoolertipjar@gmail.com or in the comments section on your bberry. Its been a blast everybody. Mike Huckabee- 10-9. Hard to see him being stopped in the Hawkeye tomorrow. Mitt Romney- 3-1 Can his organization bring him an upset? John McCain- 9-1, SRSLY? From nowhere McCain has resurrected his campaign. Kudos to Roederer and crew. Fred Thompon- 9-1 Coinflip with McCain for 3rd. His organization will have to make the difference. But why would they be motivated to when the candidate spent New Years Day on the couch? Ron Paul- 12-1. Apparently there is a bigger white supremacist, chritianist, anti-Iraq War, pro-gold standard crowd than we had realized in Iowa. Rudy Giuliani- 12-1 The wheels came off at the wrong time. Duncan Hunter 98-1 I have nothing to say about him. Back with our official R and D predictions in the AM. "If 50 percent of the turnout is evangelical Christians, it would be very difficult for us to finish first in that kind of situation,"
Glover with a must-must-must reader on which counties to watch tomorrow. On Becky Beach's home turf.. the Wakonda Club... Ed Rollins unloads on Mitten. "What I have to do is make sure that my anger with a guy like Romney, whose teeth I want to knock out, doesn't get in the way of my thought process." Do yourself a favor and read the whole story..
For those who are wondering, Band of Horses was unbelievable. 5 Stars from the Cooler. As for 'Raucus' we got some funny reviews from y'all (Sounds like you were having a good time Kevin Cooney) and we'll incorporate them as we have time. The Register poll is out, Obama and Huckabee are the favorites. But both races are tighter than a nuns... (nevermind this is a family blog).. McCain is rising and Thompson is falling in tier two. Ron Paul is doubling Giuliani. Huckabee's bizarre"I've decided to not attack Mitt Romney on air in Iowa because I am such a great Christian man, but WAIT I am going to show the ad to the entire national press corps so you can write stories about it" press conference is one that the Cooler wishes we could have been at. And Huck isn't afraid to have Walker, Texas Ranger take some pot shots at Mitten. Be back with a final line change, and more later. P.S. If you are a staffer, get off the blog and onto the telephone. Well unless you are a Huckabee staffer. Then kill sometime here. The Cooler will be partying with Band of Horses tomorrow night in Hotlanta. So we won't be able to liveblog from Raucus before the Caucus as we would like to. But we KNOW that some reporter types are going to be inappropriately drunk. So, we are respectfully requesting you email any funny Raucus before the Caucus stories to caucuscoolertipjar@gmail.com. If your story is funny enough, we'll post it Tuesday morning. Anonymity guaranteed. 4 train days.... And if you know who's going to finish 1st, 2nd, or 3rd, well you know more than the experts do. Poll #1- The one that matters. The Des Moines Register is currently in the field according to multiple sources. We will be hearing from them shortly. The results of this poll will to a large degree effect the expectations game going into caucus night. Poll #2- The one that doesn't matter. Srsly, you might as well just poll the Machine Shed. But here it is anyway. Zogby has Huck with a 1 point lead over Mitten and McCain in 3rd. Poll #3- MSNBC shows Romney leading by 4 over Huck, with Fred in 3rd... And Rudy a DISTANT 5th. Trendlines show Huckabee down 8 points from 3 weeks ago. Poll #4- Does the date on this poll say 2007 or 2006? McCain leads the Rasmussen national poll for the first time in a LONG time. Poll #5- A Lee Newspaper poll shows Huck with a 7 point edge over Mitt with Fred in 3rd. Huck and Romney are both up a couple ticks from 3 weeks ago. Poll #6- (Another POS polling firm, these guys were miserably off in 06). But for what its worth, KCCI has Huckabee with a 7 point lead as well over Mitt. Trendlines here also show Huck and Mitt up a few ticks. Poll #7- This isn't a public poll after-all. More of a "buzz." The Cooler has heard about internal polling data from 2 camps that both show Huckabee with a very narrow lead, but higher intensity among supporters. And if you think our race is crazy, nobody has got a freaking clue what's going to happen on the Democrat side. Huckabee's now famous quote that he's "not a foreign policy expert, but he did stay at a Holiday Inn" now has a visual aide. 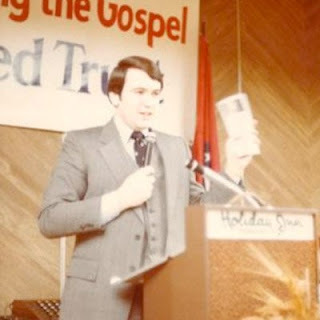 Above is a more youthful Awshucksabee preaching at...you guessed it... a Holiday Inn. Luda, Chingy, and Snoop's thoughts on the subject here. Vogel has the deets on Huckabee taking $$$ from stem cell/contraception groups. Two interesting Huckabee items from the "well-sourced" Harvard alum. Awshucksabee thinks Pakistan is west of Afghanistan. It's not. But who cares right? After all he did stay at a Holiday Inn Express last night. LAT has Huckabee with a commanding lead in the Hawkeye. Under a week until game day. To the big board! 1. Mike Huckabee- Up from 2-1 to 3-2. He's weathered the negative ad storm, the El Rushbo storm, the Bob Novak storm, the snarky blogger storm and he still maintains a lead. He's your favorite, no doubt about it. 2. Mitt Romney- Static at 3-1. Getting blasted for a week straight on WHO didn't help. But he's covered the airwaves, he's preparing his boffo political organization for turnoutpalooza. A surprise victory might just propel him to a win in New Hampshire and the nomination. 3. (tie) Fred Thompson- Up to 10-1. Big King endorsement, getting good press traveling the state, 3rd Place is up for grabs. 3. 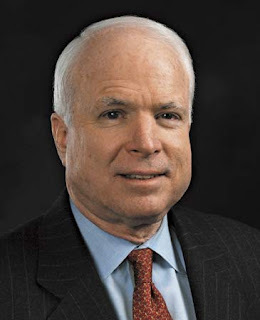 (tie) John McCain- Up to 10-1 He seems to be the guy with the mo. But the New Hampshire centric McCain operation (read: Dennehycentric) has up until this week left the guys in Iowa without much to work with from a resource persepective. 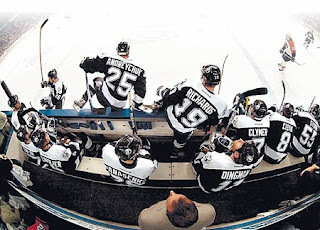 Can they tie their shoestring organization together for a 3rd place "victory?" 3. (tie) Rudy Giuliani- Down to 10-1 What happened to the once national frontrunner? He still has some GOP heavies working the groundgame in the state, but he seems to have all but abandoned IA/NH/SC in a bewildering strategy. 6. Ron Paul- Up to 25-1. You can't deny the poll numbers. Would anyone be surprised if Paul beat out one of the three people listed above? Didn't think so. 7. Duncan Hunter- Up to 98-1 on the strength of his smart, funny, and attractive statewide co-chair. Update- For nostalgia's sake, check out the Cooler line part 1 and 2 from August, 2006. Who's that guy in 3rd place? Sorry all. Real job got in the way at CoolerHQ today. Back with a line-change tomorrow. In the meantime, check out The Real Sporer's review of the McCain event today, Barack's amazing speechifying, and JMart's piece on Mittens TV monsoon in the Hawkeye. Can't imagine why you are at the Cooler if you haven't read Yepsen yet... But just in case... He has a great article today on what it means to win the bronze on Thursday.. Here in the final days, they've each realized that a third-place finish would give them a little boost into New Hampshire and the subsequent contests - and winnow out the fourth-, fifth- and sixth-place winners.In other words, there is a standby seat on the Republican plane. Welcome back, boys. We know you have many choices for your air travel. Thank you for flying Iowa. Often it is the time that calls for a leader, not the other way around. You can see examples of this throughout our nation's rich history, when courageous leaders seized moments that perfectly suited their political assets and capabilities. Read the rest of the endorsement after the jump. Make sure to also note our anti-endorsement of Mike Huckabee in the last paragraph.